You want your roofing to look great and last a long time, so trust your Angus home to our experienced crew. When you need a roof replacement for your Angus, Ontario home or business, you’ll have two things to consider. The first is getting the materials that will give you the aesthetics you desire, as well as the long-term protection you want for your property. There are several styles and levels of performance found in the shingle market these days, so finding an option that meets your needs and budget is relatively easy. The second is choosing a roofing company that will make sure the shingles get installed properly using the right underlays and techniques. 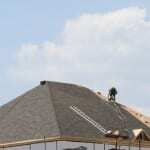 You’ll find it easy to meet all your roofing needs by calling us at Slippery Slope Roofing. Between our owner and foreman, we have more than 50 years of experience in the industry. We understand the different types of roofing, as well as the manufacturer’s requirements for installation to safeguard the warranty. We always use the proper underlay, so you get long-term results. We take the time to explain your options, so you can make an informed decision that is best for you. To make sure you get the attention you deserve, we handle just one job at a time. We won’t leave until your new roof is installed and you are completely satisfied. By not juggling jobs, we finish faster and can do a better job overall. In addition to doing roofing installations and replacements, we also handle roof repair. If your roof has been damaged in a storm or you need some areas patched to tide you over for a little while before replacement, just give us a call, and we’ll assess your roof and give you a quote for the work. You’ll find that our prices are competitive for all our roofing services.